Feb. 28, 2013 6:00 p.m. The Watoto African Children's Choir performed a brilliant program at Zion Lutheran Church in Wetaskiwin last Thursday evening, February 21st. The singing was inspiring, the costumes stunning, and the dancing very well choreographed. It was very professionally presented, from the stage set, to the big-screen power-point at centre-back stage, to the performance. At the same time, it was entertaining, informative, and worshipful. Of special note was the way the dress and dance of traditional culture combined with the worship and gospel presentation. The Watoto African Children's Choirs have been travelling since 1994. This choir, currently on a six month tour of Canada from B.C. to Newfoundland, is Watoto choir number 60. At the same time, three other choirs are touring in the U.S.A., and one is touring in England. Another choir is preparing to start a tour of Australia in May. This choir is made up of 22 children aged 8 to 13, and 10 adults. The tours are considered a training ground for these children, potentially the next generation of leaders in Uganda. While experiencing another part of the world, another way of life, these orphaned or abandoned children continue to be cared for and receive schooling. Two things are immediately evident about these children: they are happy and they are well behaved. What is Watoto? “Watoto” means “little children” in Swahili, and everyone of us is a little child of God when we come to Jesus. About 30 years ago, Gary Skinner, whose parents served in Africa for over 50 years, and his wife, Marilyn, who grew up in Canada, planted an English speaking Assemblies of God church, Watoto Church, in Kampala, the capital of Uganda. In 1993 they began the Watoto Child Care Ministries to rescue orphans. An African proverb says, “It takes a village to raise a child,” and that is the model used by Watoto. 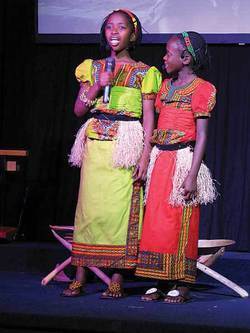 Watoto has now built three villages in Uganda, Bbira, Suubi meaning “hope,” and Laminadera. At this time, 2700 children are cared for in these villages. Houses in the villages are each home to up to eight orphans and a house mother who live together as a life-long family. Each village also has a school, a medical clinic and a vocational institute. To help the villages become self-sustaining for meat, vegetables and dairy products, there are goat farms with dairy production units, vegetable farms, and poultry farms. Young adults also learn practical skills on the farms. Men in the Watoto Church live outside the villages with their own families, but come into the villages to help with the children and provide positive father figures for the orphans. The Watoto vision is to raise the next generation of leaders for Uganda. Hence, every child in a Watoto village gets to go on a choir tour so that they may have some experience and understanding of the wider world. The children on the tour speak of being abandoned and/or orphaned and remember the despair and hopelessness, then speak with such joy of meeting Jesus and the love and care He has brought to them. Under the Watoto umbrella there are also three babies' homes where babies, including premature babies, are cared for from their first day until they are two years old. At that point they either graduate to a Watoto village or are reunited with relatives. To put the work accomplished by Watoto in perspective, in Africa there are 14 million children looking for homes. In Uganda, an estimated 20,000 children have been abducted by the LRA and forced to become slaves/wives and/or child soldiers. The HIV/AIDS scourge hit Uganda worse than most places. Duncan, the leader and spokesman for this tour, told me that his grandparents lived into their seventies, but in his parents generation, life expectancy was much less. He said that the lifespan for men dropped to a mere 42 years, and for women to 45 years, but that it has now increased to 52 years for men and 55 years for women. Today the antiretroviral medications (ARVs) are available and effective for combating HIV. If we look further back, we recall that Uganda before 1979 also endured the rule of Idi Amin, one of the twentieth century despots seemingly bent on destroying his own nation and the people in it. In 2008, Marilyn Skinner with Watoto Church started Living Hope to rescue vulnerable women, to help keep them alive to raise their own children and to restore them to dignity. From this work, she wrote the book, “Return to Dignity,” which tells the stories of some of the women assisted by Living Hope. We can hardly imagine the brutality and horror which some of these women have endured. Some were capture when 12 to 14 by the LRA where they were raped, forced to become soldiers, or horribly mutilated if they were caught after trying to escape. Others were forced into early marriage as fourth wives, but forced out of their homes by in-laws who took everything after their husbands died, leaving them destitute with their children to raise. Their stories remind us that it is within true Christianity that women and children are most valued. Through Living Hope these and other broken women find understanding, meet Jesus, have medical needs met, get some education, and learn skills, such as making jewellery or sewing, through which they can earn a living. Living Hope not only restores hope and dignity to the women it helps, but in doing so also makes it possible for their children to go to school and grow up in dignity with hope for their lives. The ministries growing out of the Watoto Church provide a hand up, enabling those it helps to become strong and capable, as well as introducing them to Jesus. This is another balanced ministry worthy of our prayers and support. More can be learned about it at www.watoto.com, and the e-mail for us is canada@watoto.com. The mailing address is PO Box 98, Victoria, B.C. V8W 2M1 or phone 1-800-9watoto.